We also routinely represent consumers involved in class-action lawsuits involving defective automobiles, pharmaceutical drugs, toxic torts, RICO, Monsanto products and other consumer products. Over the course of our law firm's history, we have earned a reputation as one of the nation's leading trial firms. In fact, we have provided representation to more than 650 affected families and individuals, resulting in hundreds of successful verdicts and settlements. Beyond our successes in and outside the courtroom, we have become a leading firm for influencing public policy, improving public awareness of the dangers of consumer products and improving public safety. We owe our ability to succeed to our 11 experienced attorneys, several of whom have practical backgrounds in aviation, engineering and other professions directly related to our areas of practice. 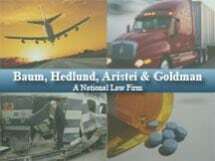 If you or someone you love suffered injury or died as a result of negligence or a product failure, contact the law firm of Baum, Hedlund, Aristei & Goldman, P.C., for representation upon which you can depend. Our attorneys will listen to your story, explain your legal options and remain at your side, providing guidance and support throughout the legal process. For more information, you can schedule a consultation at our Philadelphia law office by calling (215) 665-5659 or (800) 827-0087 or fill out our online contact form.